NEW YORK (CelebrityAccess) – Spandau Ballet, one of the icons of the New Wave era have announced that they will be undertaking their first tour of North America in almost 30 years. The Soul Boys of the Western World tour will kick off in San Francisco, CA at the Warfield Theatre and cross North America, with planned stops at the Beacon Theatre on Feb 6th and NYCB Theatre at Westbury on Feb 7th. As well, the group will appear on Jimmy Kimmel Live! on November 10th to perform and promote the tour. As well, on they will also put in an appearance on Good Day LA on Nov. 13th. 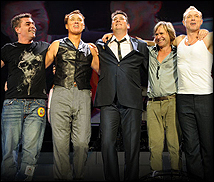 The tour will feature all five original members – Tony Hadley, John Keeble, Gary Kemp, Martin Kemp and Steve Norman – performing fan favorites from their catalog, including To Cut A Long Story Short and Chant No. 1 (I Don’t Need This Pressure On), True and Gold.